Friday night get into Houston. Eat a bowl of bún riêu . Stay up late either at home or out with friends. Saturday, wake up with help of alarm at around 11am. Eat a bowl of bún riêu . Go out and play with friends, eat lunch (yes I eat this often and it usually hurts when I’m in Houston) with friends. Go home somewhere between 5pm to 7pm. Eat a bowl of bún riêu. 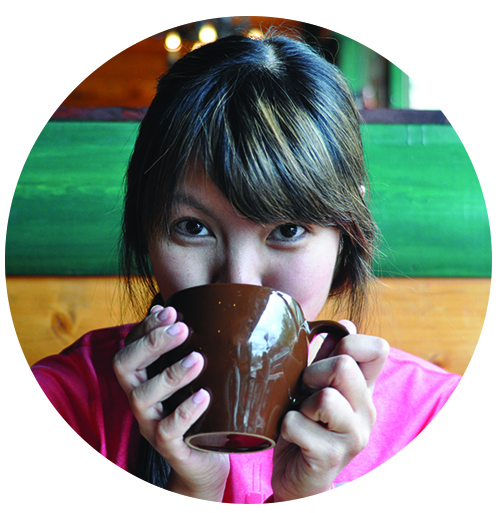 Between 6pm to 8pm, eat dinner with friends. Play all night with friends. Sunday morning at around 10 am, eat a bowl of bún riêu. At around 12pm eat lunch or brunch with friends. I LOVE THE STUFF. It makes me incredibly sad that it’s not a popular dish in actual Vietnamese restaurants. I always look for it when I dine out at Viet places and have only found one eatery who offered it (Lilly’s Sandwiches in Chinatown, Austin, Texas back in August 2008. That’s the thing about being a food blogger who also journals, I can time and date a lot of my meals!) and it was of course significantly sub par to momma’s. My mom suspects it’s not popular because it’s not a very meaty soup. A lot of the other traditional noodle soups from Vietnam are beefy. I guess the solution to this is finally learn how to make it. Bún riêu is a Vietnamese meat rice vermicelli soup. There are several varieties of bún riêu, including bún riêu cua, bún riêu cá, and bún riêu ốc. 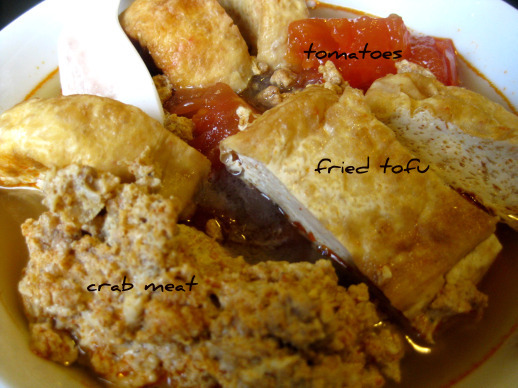 Bún riêu cua is served with tomato broth and topped with crab or shrimp paste. In this dish, various freshwater paddy crabs are used, including the brown paddy crab found in rice paddies in Vietnam. The crabs are cleaned by being placed in clean water to remove dirt and sand. The crabs are pounded with the shell on to a fine paste. This paste is strained and the crab liquid is a base for the soup along with tomato. The crab residue is used as the basis for crab cakes. Other ingredients for this dish are: fried tofu, mẻ or giấm bổng (kinds of rice vinegar), Garcinia multiflora Champ., annatto seeds (hạt điều màu) to redden the broth, huyết (congealed pig’s blood), split water spinach stems, shredded banana flower, rau kinh giới (Elsholtzia ciliata), spearmint, perilla, bean sprouts and chả chay (vegetarian sausage). This dish is rich in nutrition: calcium from the ground crab shells, iron from the congealed pig’s blood, and vitamins and fiber from the vegetables. A lot of people put the congealed pig’s blood in it and though I do not have a thing against congealed pig’s blood (funny fact, growing up my parents lied to me and told me congealed pig’s blood was chocolate), I just don’t eat it with my bún riêu. Also, a lot of people tear in fresh herbs but not me (which kills my momma). 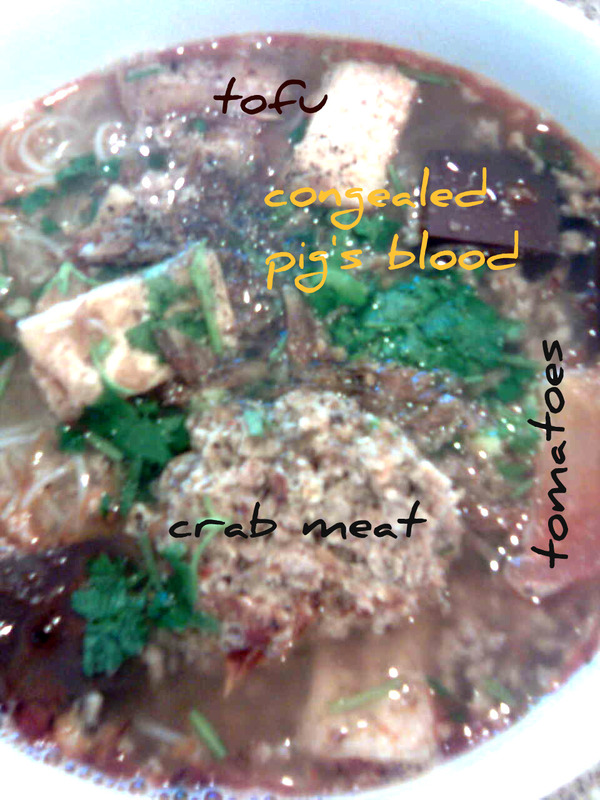 I eat it with my mom’s fantastic broth, noodles, fried tofu, tomatoes, and that awesome crab meat. Here’s a photo of my momma’s bún riêu.